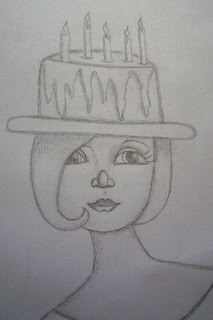 Well this is a sketch I drew a few days ago since I am celebrating a big one today...yes I am 50. It is actually a little hard to say it but that is what it is. So I didn't dare draw 50 candles I wouldn't have room on this birthday cake hat but it symbolizes many things for me, too many to mention and some very personal. 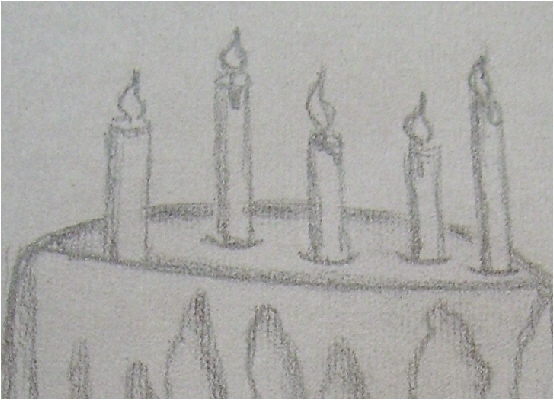 But turning 50 is a milestone and I have learned a lot along the way and hope to keep learning. PS thanks Mom and Thom!!!!! We love you!!! Happy Birthay!!!!! Have fun on your motorcycle ride! I would love to do that today too but to rainy here! :O) Enjoy your special day!!! Love your drawing- I do not have the gift of drawing! Happy Happy Birthday!!! Oh my gosh Les... 50... BIG congrats... didn't know this weekend's birthday was a milestone one... and the Harley ride sounds fab... I've done that once... and LOVED it... freedom!!! wishing you a year that overflows with days that feel wonderful to you! Love the hat Les! Happy 50th Year!!! I turned 50 in March and ya know, it didn't hurt a bit. Much love!